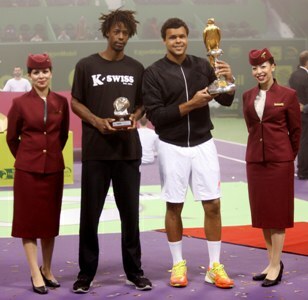 Doha, QATAR – World number six tennis star Jo-Wilfried Tsonga put on a top performance in Qatar over the weekend, winning the Qatar Airways-sponsored Qatar ExxonMobil Open 2012. The French star won the title in two straight sets, beating compatriot Gael Monfils, 7-5, 6-3, in front of an enthusiastic crowd at the Khalifa International Tennis and Squash Complex. Qatar Airways, Official Airline of the six-day event, has been a strong supporter of the tournament over the years. The tournament saw former World Number 1 crowd favourites Roger Federer and Rafael Nadal compete, but they failed to make it to the final. Tsonga will now compete in next week’s Australian Open in Melbourne, his sixth time playing in the prestigious competition since turning professional in 2004.